It’s official, Eurocopter has rebranded as Airbus Helicopters in a positioning move that now sees the EADS group rotary aircraft activities now sit beneath what is the strongest group brand – certainly in terms of its household name status. Aerospace branding specialists Design Inc has been helping our clients through this major rebranding process. We have developed a special ‘welcome on board’ campaign to communicate the rebranding. 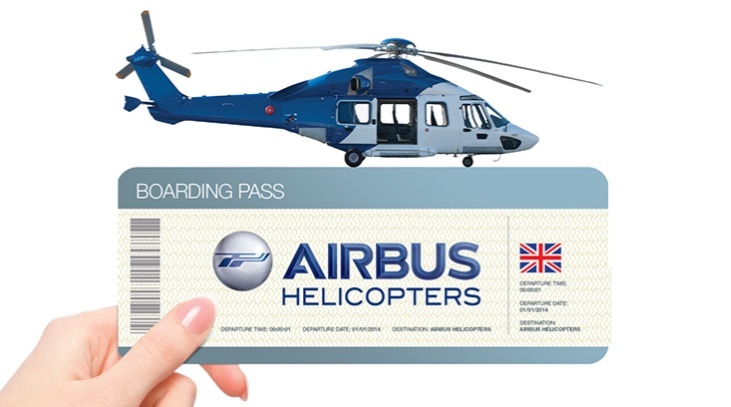 This has been deployed on the main Airbus Helicopters website as well as in print and prominent billboard sites at the main Airbus Helicopters manufacturing and office locations. The welcome onboard message was developed to encourage brand engagement as well as a renewed commitment to customer service for which Airbus is well known and respected. In addition, midway through it’s original planned lifecycle, our genre challenging global advertising campaign (conceived originally for Eurocopter) has now been adapted to work within the new Airbus Helicopters brand template. We continue to provide aviation and specialist publications globally with multiple executions and translations for the original corporate Think Service and Think Innovation adverts as well as the main 5 missions Think Business, Think Oil & Gas, Think Medical Emergency and Think Law Enforcement advertisements. The military missions – beyond the original Think Defence now comprises Think Armed Scout, Think Naval Operations, Think Search & Rescue, Think Special Operations etc. As aerospace branding specialists we are in a strong position to support Airbus Helicopters, who are the world’s biggest supplier of commercial helicopters. In the UK Airbus Helicopters provide many of the platforms used by the emergency services, utilities and the current reengineering of the Puma 2 for the armed forces. We also work for Bombardier – leading manufacturers of fixed wing commercial and business aircraft, STAG Aerospace – the respected aerospace spares solutions provider and software houses Tracware, FDS and Airops Software. Our own unique proposition is based on our optimised team of consultants whose expertise combines deep aerospace manufacturing and marketing insight and long association with the sector as with an award winning track record in advertising and design. To speak with one of our aerospace branding specialists please contact Dan Gilbert on 01784 410380 or by email.